Marquise diamonds wield a magnificent presence when paired with other stones. 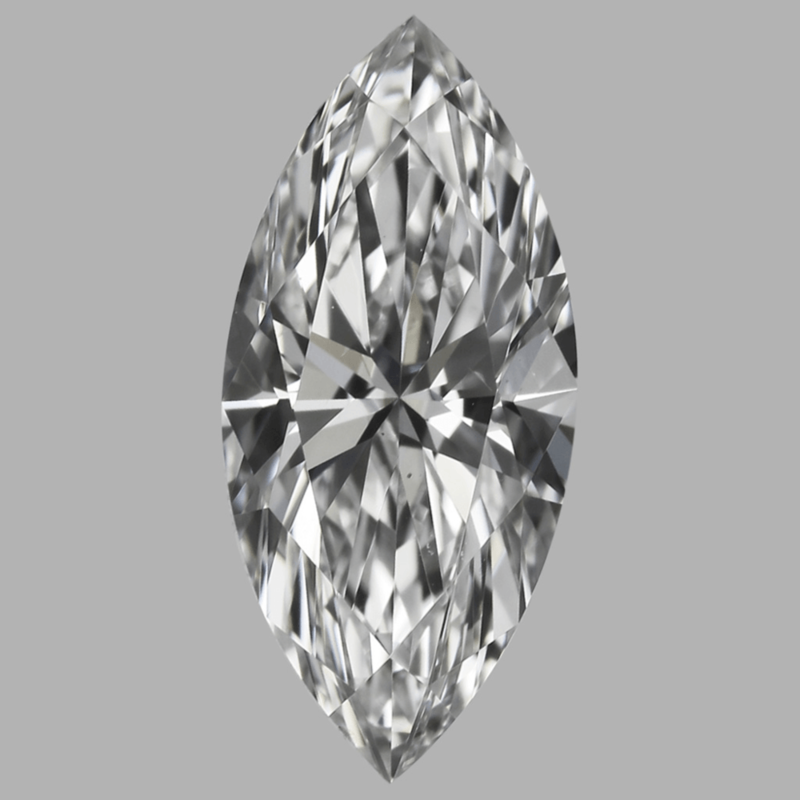 The Marquise’s stunning, bold shape elevates any setting and may be paired with any size or shape of a center diamond. Whether the wearer chooses larger carat Marquise side stones for drama, or dons dainty Marquise accents for a feminine flirty design, the marquise diamond cut magnifies the beauty of every piece it graces. 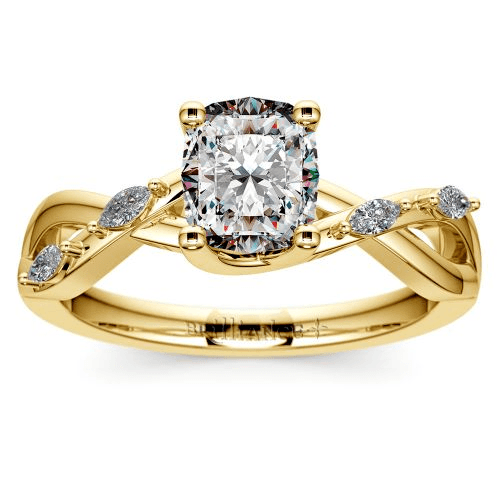 Use marquise diamond side-stones to finish your masterpiece of a ring. The shape paints details within a design to complete images of nature or bold geometric patterns, and it contrasts quieter shapes like the round brilliant. Design your beloved’s engagement ring with love and pure passion and use the inspiration of the Marquise to add influence and regal intrigue to the ring that seals your future. 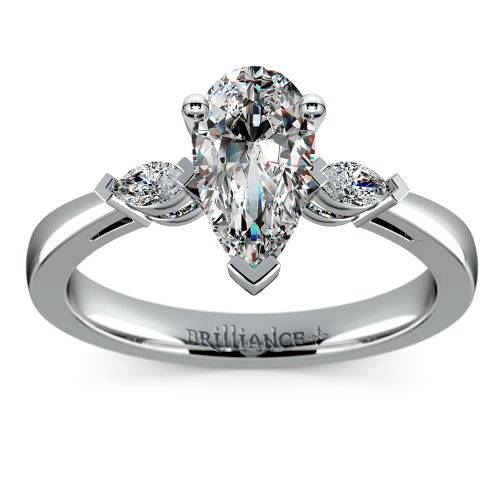 Beyond the 4C’s equates the Marquise shape diamond with women who are “stylish, [have a] flair for drama, [are] daring, innovative and full of zest.” While many select more traditional side stone shapes like round, baguette or princess, selecting the Marquise for side stone accents reveals a personality that stands out from the crowd. When used as a center stone the Marquise is a stone that transforms the finger—thinning out the hand like perfectly cut couture. However, the length of the shape also boosts the appearance of the carat weight of the ring. As longer diamond shapes give the illusion of a larger carat weight, selecting the Marquise for side stones provides a budget-friendly means to create a more extravagant look. To get the most from Marquise side-stones, choose stones that have a high color grade (don’t go lower than G or H). Be sure to also select stones that also have been graded high in clarity (VS2 or higher), as elongated stones tend to show flaws easier than round or princess shapes. A D color VS2 clarity marquise diamond shows no color and no visible inclusions. Adding to the beauty of the Marquise is the shape’s flexibility in design. Unlike square-shaped or round diamonds, the Marquise can be oriented many different ways to add a whole new dimension to a design. Horizontally-placed Marquise side-stones provide a stately contrast against round or square center stones. Flipping the marquise to the side also creates shapely contrast when paired against a bold Marquise center diamond. Some individuals also love the look of the vertical Marquise set against a pear-shaped center stone or oval center diamonds. Marquise diamonds may be positioned in v-shaped patterns to draw a Missoni-inspired chevron design. For mega-Missoni inspiration, create a zig-zag design of white diamonds, black diamonds and colored marquise cut gemstones. The shape of the Marquise mirrors the swooping and green-kissed delicate design of foliage and the dew dropped leaves on spring blooms. Use Marquise side-stones to create an ivy embossed ring or as the sparkling leaves against a band’s floral design. Paint with the Marquise. Use the shape to complete the perfect swooping accents in a romantic antique design. Pull inspiration from nature to create a spiraling weave of wisteria with magnificent Marquise leaves. The Florida Ivy engagement ring uses Marquise diamonds to create the ivy leaves of its vine-inspired design. Colored marquise diamonds or marquise-shaped gemstones create perfect petals for floral designs. The shape of the upright Marquise can resemble a closed tulip or rosebud. Showcase a sparkling bouquet with marquise side stones placed to create a secret garden within the ring. 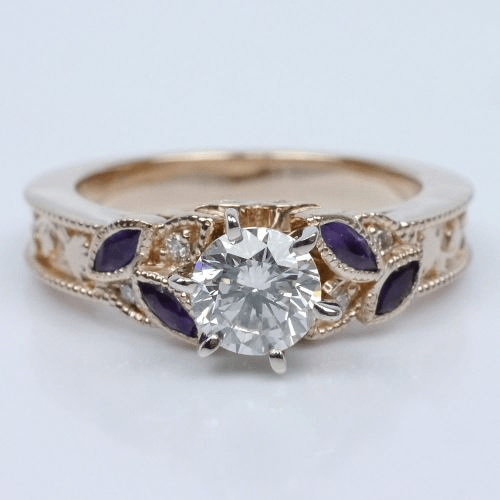 In the custom-made Vintage Diamond and Amethyst Floral engagement ring, Marquise shaped amethyst are used within the ring to draw colorful buds elevating the floral romance of the design. A halo of marquise cut stones can also evoke a flower with dramatic effect. Create specific numbers of petals using larger or smaller stones to call up images of her favorite flower when designing a ring. 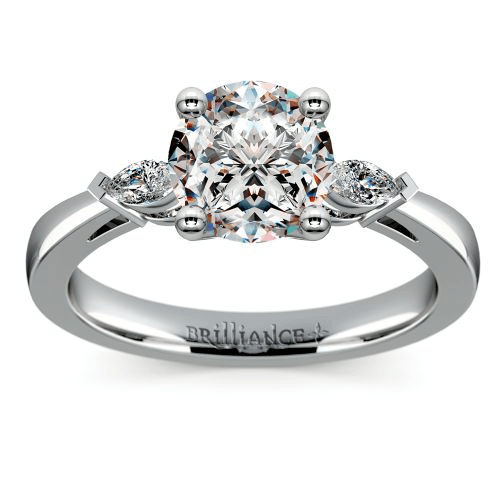 Marquise diamonds transform the design of an engagement ring with regal resplendence. The namesake of the stone’s cut held court over King Louis XIV’s heart and helped to reshape the image of the diamond forever. Wearing the Marquise is to channel royalty and seductive romance, and the diamond speaks to those who appreciate its unique and shapely appeal. Choose the Marquise diamond cut to create a ring design with strong personality, joi de vivre and royal Brilliance.